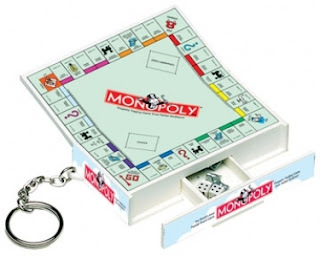 I love this little Monopoly Game Keychain! I cannot count how many times I go somewhere, and I get bored. I always tell myself I'm going to bring something to consume the time.. But I never do. Usually, when we go to restaurants we end up rolling little pieces of straw paper and playing a mini version of hockey with our fingers.. Well no need to do that anymore! Whats the one thing that you ALWAYS have with you when you go out? Your key's of course! The second I got my Monopoly Keychain, of course I had to play it :)! It was just like the original game.. Only in mini version! Right after out first time playing I put it on our keychain, so now next time we go out to eat, and we have to wait, we'll have something to do! The Monopoly Game Keychain is great to have around! Especially if you have kids (8+)! 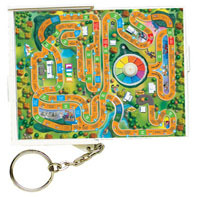 One day I hope to also add the LIFE Keychain to my collection, because my favorite board game is LIFE :). Wholesale Keychain has a lot of game keychains available! Which game keychain would you get? Disclosure: Review product was provided to me free of charge. All opinion expressed are my own, and were not influenced in anyway. Facebook is not involved in any way. Thanks again to Tomoson for partnering me up for this review. THose are really cool! I would love to have the scrabble keychain! They have a bunch of classics! I like Trouble,Don't Spill the Beans and Simon. What a great idea! I love Monopoly - will have to check that out. tweeted for you too! This is cute, great for summer travel! This is so cute! Huge Monopoly fan here! What a great idea!!! What a great idea for boredom in doctor's waiting rooms! I could use a few of those in my purse for waiting times.